Photo: Ebenezer Heath House, ca. 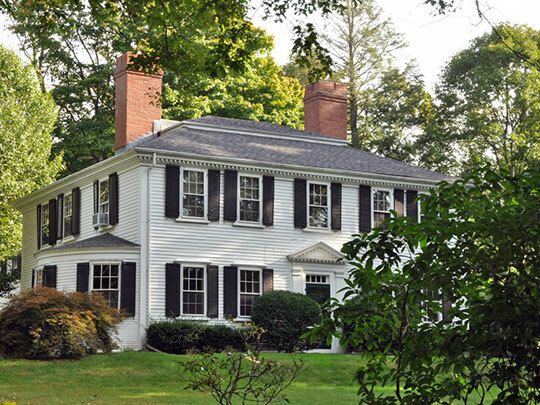 1791, 30 Heath Street, Brookline, MA. Listed on the National Register of Historic Places in 1985. Photographed by User:Magicpiano (own work), 1011, [cc-by-3.0 (creativecommons.org/licenses/by/3.0)], via Wikimedia Commons, accessed August, 2013. Norfolk County administrative offices are located at 614 High Street, Dedham MA 02026; phone: 741-461-6105. As originally erected (1793), the County of Norfolk consisted of twenty-one towns, to wit: Bellingham, Braintree, Brookline, Cohasset, Dedham, Dorchester, District of Dover, Foxborough, Franklin, Medfield, Medway, Milton, Needham, Quincy, Randolph, Roxbury, Sharon, Stoughton, Walpole, Weymouth and Wrentham. It is not certain who is responsible for the county's name. In the bill a space was left and the name "Norfolk" was inserted just before the final passage of the measure. Geographically, the name is inappropriate. As the first settlers of Massachusetts were English people, it was natural that they should adopt many of the names of their native land. In the eastern part of England, on the shores of the North Sea, there are two counties called Norfolk and Suffolk. The inhabitants of the northern county were originally known as the "North Folk," and those of the southern were called the "South Folk." In time the names were shortened to Nor'Folk and Sou'Folk, and the counties became known as Norfolkshire and Suffolkshire. It is related that not long after Norfolk County, Massachusetts, was organized, John Randolph of Virginia walked up to John Quincy Adams in the national House of Representatives, of which both were then members, and said: "Look here, Quincy, how is this? You live in Norfolk County; now what the devil do you people in Massachusetts mean by setting off Norfolk County and putting it south of Suffolk County?" Norfolk County is distinguished as being the birthplace of four U.S. Presidents: John Adams, John Quincy Adams, John F. Kennedy, and George H. W. Bush.